UPDATED: Fri., May 25, 2018, 1:43 p.m.
ST. PETERSBURG, Russia – Russian President Vladimir Putin on Friday bemoaned troubled relations with the United States, saying Russia wants to improve them but is effectively held hostage by the disputes surrounding President Donald Trump. Putin’s comments in a meeting with top editors of international news agencies underlined how Russia’s once-high hopes for improved relations under Trump have eroded. Although the Trump administration has imposed sanctions on Russia and expelled scores of its diplomats, Russian politicians generally portray Trump as blocked by domestic opposition from fulfilling his campaign promises of improving relations with Moscow. 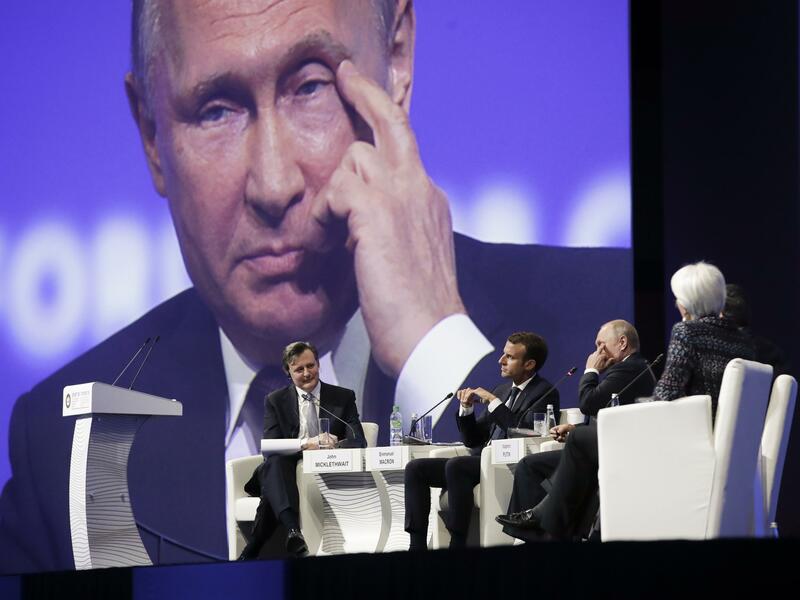 Earlier in the day, speaking at an annual economic forum, Putin sharply criticized Trump’s decision to pull out of the Iranian nuclear deal, saying it could trigger dangerous instability. The Russian leader said the U.S. withdrawal from the 2015 agreement came even as the international nuclear watchdog confirmed that Tehran was fulfilling its obligations. “What should it be punished for, then?” Putin asked. Trump’s administration has demanded that Iran stop the enrichment of uranium and end its involvement in Syria, Yemen, Lebanon and Afghanistan in order to negotiate a new deal. In the meeting with editors, Putin declined to assess relations between Trump and North Korea’s Kim Jong Un, but said the United States should not try to take a hard line with the country. Putin also expressed frustration at having little contact with Trump and faulted the investigation into whether there was collusion between Trump’s campaign and Russia and whether Russia tried to interfere with the 2016 U.S. election. “Don’t you worry, we will help ensure your security,” Putin said. Macron responded on a serious note that France and its allies could stand for themselves. Published: May 25, 2018, 8:55 a.m. Updated: May 25, 2018, 1:43 p.m.